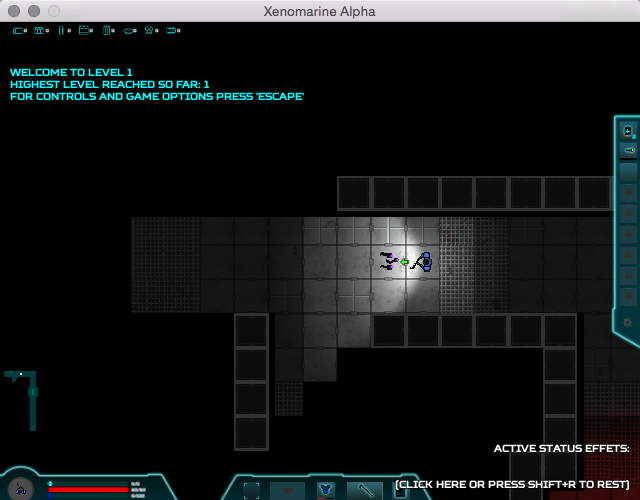 XENOMARINE is a sci-fi-horror themed roguelike in which you play a space marine exploring a dark alien-infested space station. You start out with nothing but a crowbar, a torch running low on battery and some battered armor...and high hopes of finding some powerful alien tech! In the remainder of this two part series I will be briefly describing some of the key new features available in the Alpha version. In this article (part I) I’ll cover the new levels, weapons, armor and equipment, as well as drones and the new skills available in the Alpha. In part II, I’ll be focussing on the changes adding variety to level design both in terms of gameplay and graphical features, as well as taking a look at some user interface improvements. Xenomarine will eventually feature ‘infinite’ gameplay, with never-ending levels offering the challenge of getting further than ever before (and beating your highscore!). There’s a lot more content to add though before that becomes possible, and in the meantime the Alpha offers 15 levels (up on only 3 in the Demo version). The random level design in Xenomarine means that each time you play you will get a completely different set of levels, not only in terms of the layout and size of the levels but also in terms of which alien types you will encounter and what weapons, armor and items you will find. At the same time everything has been carefully balanced so that despite this variety each level offers a gradual step up in terms of difficulty. I don’t want to reveal too many of the new weapon types available in the alpha, but yes, there’s chaingun! There’s also lots of new grenade types, and for the first time also new heavy armor and shield types. But the most important new items in terms of game mechanics are the over 20 items that can be used to upgrade weapons in various ways: targeters that increase ’to hit’, power enhancers for damage, and ammo or blade enhancements that add status effects like fire to normal weapons. Oh, and night vision goggles anyone? Another easily noticable new features is the introduction of drones. As you explore the randomly generated space station you will quite soon come across spherical drones peacefully floating in the air and going about their business. As these drones have a light source of their own, it can be quite useful to follow them around, as they will illuminate any aliens they come across, even if they are out of range of your own torch. A unique new feature of drones is that each one has slightly different, randomly generated stats, and even a randomly generated name combined of letters and numbers (and vaguely reminiscent of a certain robot from star wars!) Nevertheless, they come in a few basic models, of which there are two available in the Alpha: scout drones and combat drones. Scout drones are unarmed, and therefore harmless, though as mentioned potentially useful in illuminating areas at a distance from the player. 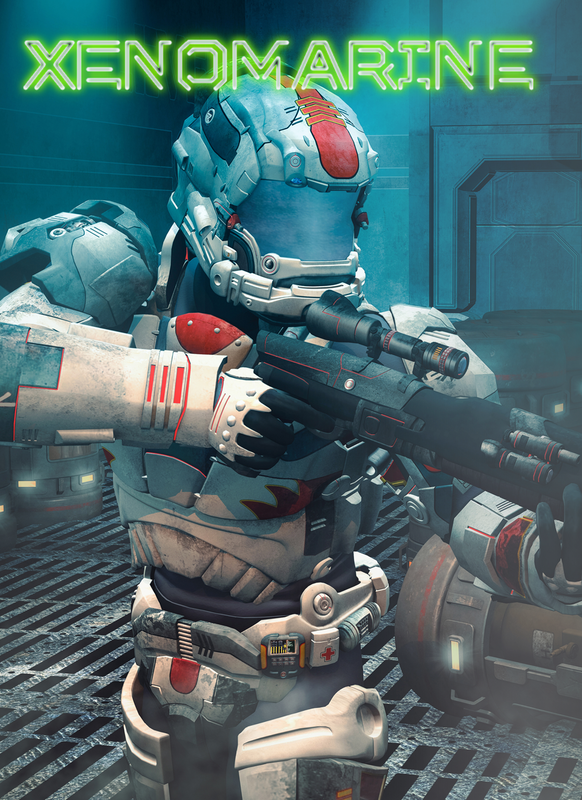 Combat drones, as you might expect, are armed (with partially random combat stats), so it is best not to make them angry! Combat drones will be neutral when first encountered, however will become hostile to the player if damaged, so it’s best to avoid catching them in a blast zone by accident! 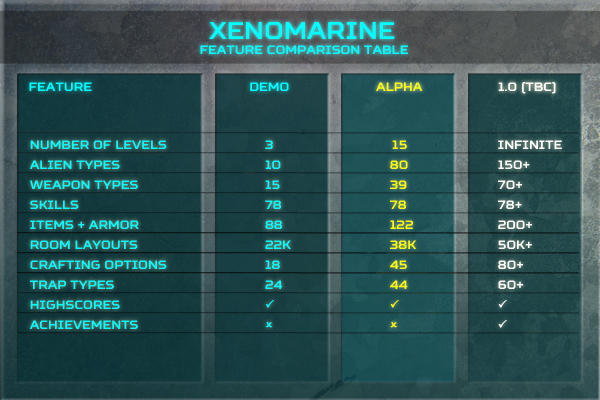 The skill system in Xenomarine also sees some significant improvements. First of all, there are two all-new skillls:hacking and alien tech. Hacking skill, at least in the current version of Xenomarine, just has one use, but it’s an important one: enabling use of a ‘hacking device’ which allows you to take control of drones. 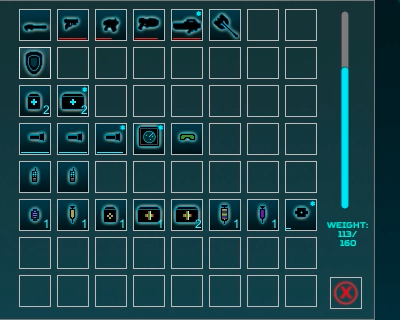 Alien tech is similarly limited in the current version of the game, though eventually it will increase the player’s ability to use a wide range of different alien tech items. The Alpha introduces alien tech for the first time with the ‘mind globe’ which enables the player to temporarily take control of the aliens themselves! Other improvements to the skill system include a simple but effective change whereby available skills flash to make your options clearer, and the introduction of ‘classes’. As you learn more skills you will automatically acquire a new class, which is shown both in the terminal and is eventually stored as part of your highscores. You can now experiment with different combinations of skills and become everyting from a ‘close assault mechanic’ to a ‘Xenomarine commander’ or ‘Ninja master’! It may seem like a boring technical thing, but the introduction of UI scaling (though there’s still some more work to be done in this area) finally makes it possible for those who use very small or very large screens to play Xenomarine. Here’s an example of Xenomarine at 640x480 in mac windowed mode! Finally, I have to mention the new scanner animation, heavily inspired by the film ‘Aliens’ (which is of course a big inspiration for the game as a whole), and which is featured at the start of the trailer above. Alien blips gradually appear based on their distance from the player, and there’s an atmospheric scanner beep sound that now subtly increases in pitch as the aliens get closer - just like in the film! Visit the download page or check out the website, and follow Xenomarine on Twitter. Xenomarine: now on Steam Early Access! Thanks for the update, great demo so far! * When I saved and exited the game, then reloaded, I lost some of the character upgrades I'd chosen:- particularly, crafting level dropped to zero from 2. * In some of my games, mid-way through (about level 3), exploding barrels stopped disappering from view when I blew them up, and also scrap piles stayed on the screen (I couldn't pick them up twice though). Great, thanks a lot for the feedback, I'll be releasing a new update in the next couple and I'll make sure to fix these bugs!